KOWIN continuously dedicates to the research & development and marketing of various types of plastic recycling machinery for a long period—providing high efficiency recycling machinery and helping customers recycle plastic waste and reproduce into final products. 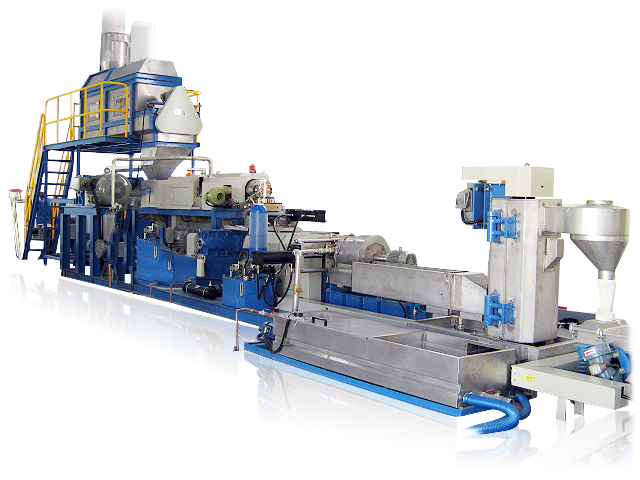 In this article, we will simply introduce you one of plastic waste recycling machinery – Die Face Cutter Extruder. Based on expertise technique, KOWIN designs and manufactures the die face cutter extruders in aspect of customer and operator. A production line of low power consumption, high capacity and easy-operation, it allows customers to produce high quality recycled pellets. KOWIN continues researching and developing updated machines for customers. The only die face cutter extruder in Taiwan is able to smoothly recycle PP woven sack in high capacity. Patent force feeding system. The powerful compounding & force feeding system is controlled by inverter. Inverter also can control the force-feeding sweeping speed, and the speed adjustment is decided by the frequency of force-feeding sweeping direction (run clockwise & change being turned reverse automatic as per the frequency change). No bridging situation. It absolutely 100% solves the problem in using the machines of other suppliers. Heavy duty construction design, no vibrating in machine while production. Very low ampere when in full production. Energy-saving. As a professional plastic waste recycling and reproducing machinery turn-key plant manufacturer, KOWIN, providing a variety of high quality plastic recycling machinery. If you are interested in understanding more information about die face cutter extruder, welcome to visit the website of KOWIN, and feel free to send inquiry or contact with us for further details!